Our mission is to empower cyber security and risk professionals to make better decisions to reduce their cyber risk exposure. In this sense, not all vulnerabilities are created equal. 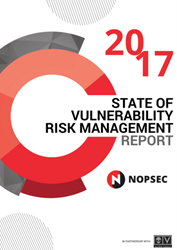 NopSec, a world leader in cybersecurity analytics, threat and vulnerability risk management and remediation, today released a new report, “The 2017 State of Vulnerability Risk Management”. The annual report reveals emerging threat intelligence sources, security threats by industry, and the steadily rising correlation of social media and cyber threats. Conducted by the NopSec Labs research team, the report analyzes over a million unique vulnerabilities, 100 unique dark web properties, and nearly 90,000 vulnerabilities contained in the National Vulnerability Database over a 20-year period. Get the report now. Dark Web data is an emerging threat intelligence source for cybersecurity companies to evaluate how important vulnerabilities are even if they do not have public exploits associated to them. Relying solely on the CVSS Base Score makes it impossible to accurately prioritize vulnerability risks at scale for organizations of all sizes. Social media has remained a top platform for cybersecurity professionals to evaluate the risks associated with emerging vulnerabilities. Application-related vulnerabilities remain a top priority for organizations to remediate, as recent security breaches also demonstrated. NopSec’s continued innovations has focused on pioneering a way to measure vulnerability risk based on threats to the organization’s valuable assets in an event of a potential breach. NopSec’s award-winning Unified VRM SaaS platform utilizes the E3 Engine, the world’s first security controls validation and analytics measurements technology to evaluate and explore opportunity for exploitation and control effectiveness. Download the 2017 State of Vulnerability Risk Management Report and Register for the Webinar to explore the findings in more detail. NopSec provides automated IT security control measurement and risk remediation solutions to help businesses protect their IT environments from security breaches. The company's flagship SaaS product, Unified VRM, utilizes passive analysis, active exploitation and contextual enrichment that enables security teams to visually forecast threat risk, and dramatically reduce the time to remediation of critical security vulnerabilities across infrastructure and applications. For more information, visit http://www.nopsec.com or follow us on Twitter @nopsec.